Medical imaging is often perceived to designate the set of techniques that noninvasively produce images of the internal aspect of the body (or parts and function thereof) for clinical purposes i.e. medical procedures seeking to reveal, diagnose or examine disease. We provide visualization to such images through our products. We offer services too in this space. With PACS support, it allows creation of patient database with all requisite info; analytics module supporting 3D viewing, picture archiving to create extensive patient history data; Structured Reporting and recording Tele-Consultation, Video/Image Conferencing etc. 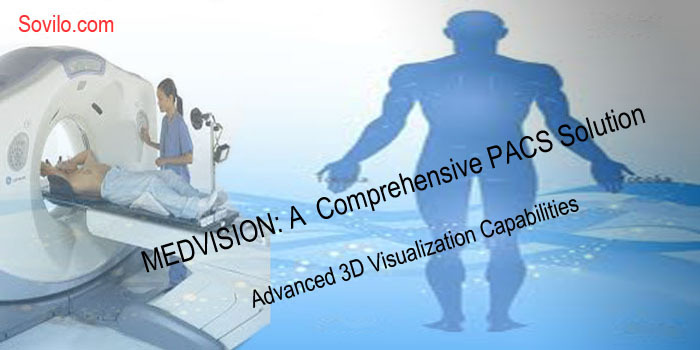 Sovilo Technologies provides medical visualization and industry standard PACS planning, design and implementation services too. We have expertize in traditional imaging techniques and modalities for the human body. We have done multiple projects on cross-modality imaging (CMI) as well. CMI helps characterize diseases with high temporal and spatial accuracy. Collaboration between physicians and access to your medical images anywhere, anytime is imperative. Providing the best patient care requires mobility and real-time access to medical images regardless of your location. We are masters in PACS and help our clients migrate to Cloud based RIS (radiology information systems) where the doctors and radiologists can access the images through various devices i.e. Windows Mobile, iPad, iPhone, Android Mobiles etc.